The S-5-U clamp is by far our most popular and most versatile clamp. It will fit about 85% of the standing seam profiles manufactured in North America — including most structural and architectural profiles. It can be used on vertically oriented seams, and by rotating the clamp 90 degrees, it can also be used on most horizontal 2” seam profiles. Its simple design, generous dimensioning and multiple hole orientations are what make it so versatile for use with S-5!® snow retention products and other heavy-duty applications. The S-5-U clamps has been tested extensively on a wide variety of applications. To view test data, click here. Note: This link will take you to S-5!’s website. The S-5-U is perfect for S-5!® snow retention products and other heavy-duty applications. S-5-U clamps are each furnished with the hardware shown above. Each box also includes a bit tip for tightening setscrews using an electric screw gun. A structural aluminum attachment clamp, the S-5-U is compatible with most common metal roofing materials excluding copper. All included hardware is stainless steel. 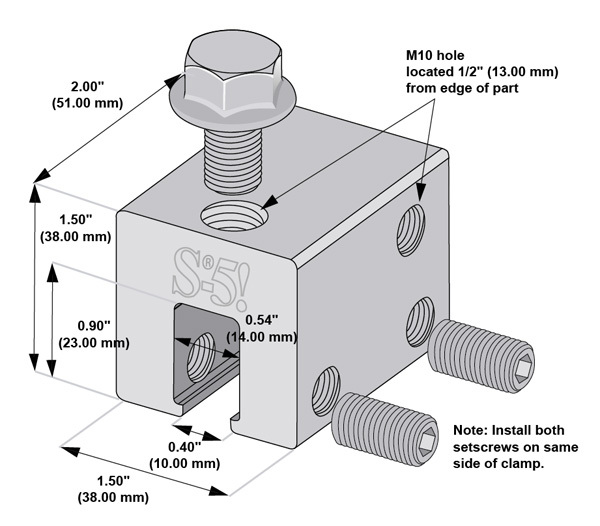 S-5-U Mini clamps are each furnished with the hardware shown above. Each box also includes a bit tip for tightening setscrews using an electric screw gun. A structural aluminum attachment clamp, the S-5-U is compatible with most common metal roofing materials excluding copper. All included hardware is stainless steel. Installation is as simple as placing the clamp on the seam and tightening the patented round-point setscrews to the specified tension. Then, affix ancillary items using the bolt provided. 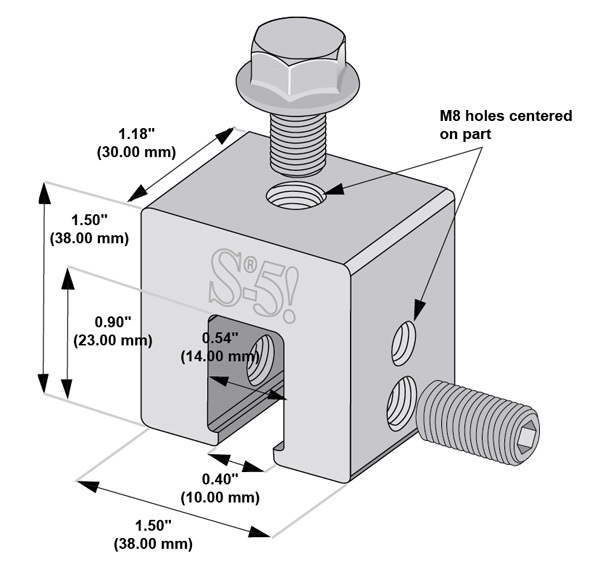 Thanks to our patented round-tip setscrews, S-5! clamps do not pierce metal roof paneling, thereby protecting roof coatings and weather tightness warranties. Please note: The above image illustrates the S-5-U. The steps remain the same for the S-5-U Mini; however, there will only be one setscrew on the clamp.